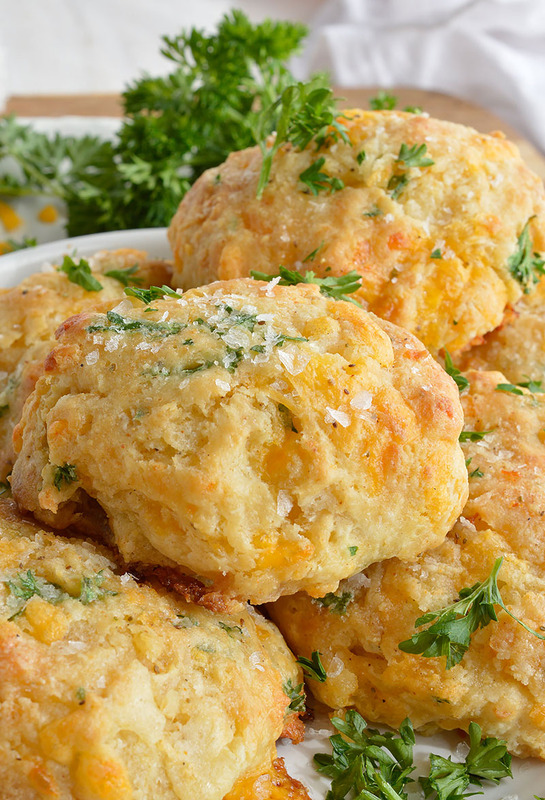 Cheddar Bay Drop Biscuits are full of flavor and light as air. These are inspired by your favorite Red Lobster Biscuits Recipe with cheddar cheese, buttermilk, fresh parsley and Old Bay Seasoning. Perfect for a quick dinner side dish or holiday feasts! Combine yeast and pinch of sugar to warm water. Stir to dissolve; set aside for 5 minutes or until foamy. In large bowl, mix flour, baking powder, baking soda, sugar and Old Bay Seasoning. Using a pastry blender, cut cold butter into dry ingredients until butter is the size of peas. Stir in buttermilk and yeast mixture. Stir in cheddar cheese and parsley. Do not over mix. Using hands mix dough until it just comes together into a large ball. Generously spray baking sheet with nonstick spray. Place a second baking sheet underneath to prevent bottoms from getting too brown. Measure ¼ cup of dough, form into 3-4 mini patty shapes that are flat on top. Transfer to baking sheet. Space each biscuit 2 inches apart. Repeat with remaining dough. Mix melted butter and ¼ teaspoon Old Bay Seasoning. Bake biscuits 10 minutes. Brush with melted butter mixture and sprinkle with flaked salt. Bake 2 additional minutes, or until light golden brown. Serve warm. Recipe created by Wonky Wonderful. Can this be made in a bread machine and then baked as biscuits in the oven? If so how would I do it? Because this is a no-knead recipe, and the butter needs to be cut into the dough, a bread machine would not be suitable for this recipe.